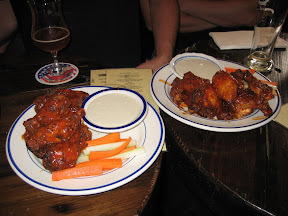 Rumor has it that the new Blind Tiger Ale House (it moved) has some of the best wings in NYC. Leave it to us to find out. 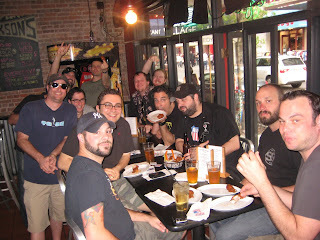 After choosing some Brooklyn Local 2 and Allagash White from one of the most unique collections of beers we have ever seen, we placed an order for 40 wings. Owner Alan Jestice joined us for a quick chat to talk about the wings. 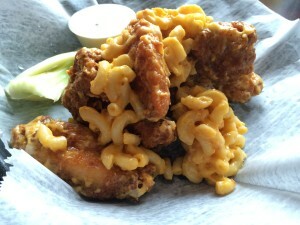 Blind Tiger bakes, not fries, their wings unlike most other places. Their wing is neither hot nor medium, its a chipotle flavored wing. That disqualifies it for our ranking but who are we to say no to a wing?? 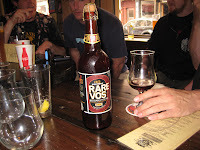 Alan slapped a bottle of Rare Voss Belgian Style Ale from 2000 and wished us happy winging. 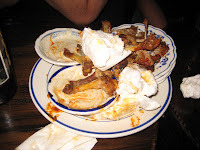 The wings didn’t last more than a couple of minutes as the Wing-Off crew demolished the entire lot. 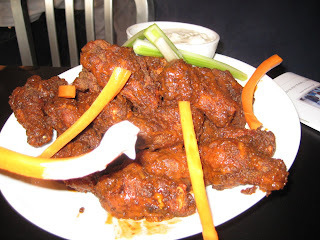 They were really saucy and quite different than an normal wing. The baking process not only means it takes longer to make them but also leaves the meat softer. The chicken fell right off the bone and melted in your mouth. The flavor was nice and smokey with some pepper flavor, not very hot though. They were some damn tasty wings and they left a little after bite. 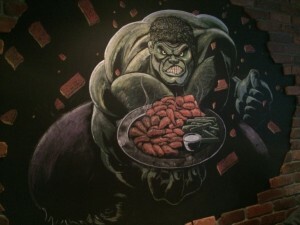 Only a few blocks away from our first location, Thunder Jackson’s known as a party place with some tasty bar food. 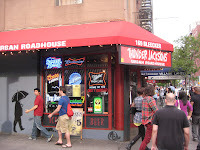 TJ’s describes their establishment as an “Urban Roadhouse” and serves it up with all the party accutriments like Das Boot, made famous by the movie “Beer Fest.” As we entered Thunder Jackon’s we were met with a site that took us a moment to process; a large group of Elvi (the plural for Elvis) drinking at the bar. 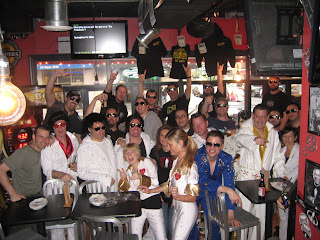 Turns out that the New York City Wing-Off had chosen the same location as the Elvis Pub Crawl for charity! Seems like a funny concept but as Linday, the crawl organizer, explained to me, they drink around the city in Elvis garb and raise money for Orphans International. 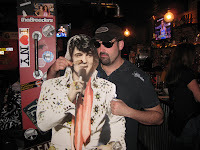 So we all bought a pair fo Elvis sunglasses ($5 and it goes to the charity) and got one big Hot Winging Hound Dog photo. o Simone, our fantastic server. 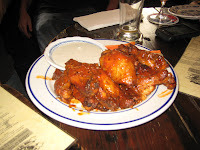 Kyle had the chef stage and serve up all kinds of different wing types they have at Thunder Jackson’s. We ripped through some Angry, Dirty Angry, Pissed and then they tested out a new wing on us, the Chipotle . The wings at TJ’s are all fried and breaded so they were completely different from the Blind Tiger. The ANGRY ones were juicy and crunchy. 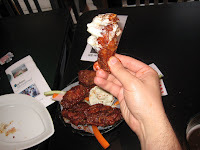 The Angry Dirty wing had a really unique dry rub that gave it a nice flavor. The Pissed wings were spicy hot on the first bite but had no after bite. They were tasty and delicious. The Chipotle wings were the one that stole the show for me. A nice smokey and hot flavor and juicy all the way through. 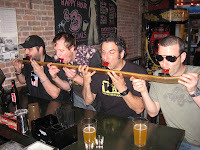 However, as neither The Blind Tiger Ale House nor Thunder Jackson’s did not have standard hot and medium for which we judge, both are disqualified from the Wing-Off. 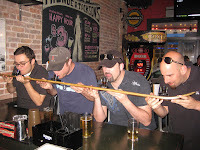 Blind Tiger could have used some Budweiser, but the wings were good. 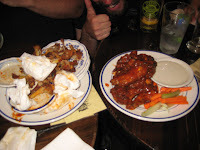 I’d eat both wings again if happened to be at that bar, but wouldn’t make a special trip for them. I’m a fan of anything chipotle-flavored (even the McDonald’s-owned Mexican restaurant. Even though neither wing qualified for voting, I gotta say there was a tie between Blind Tiger Chipotle and Thunder Jackson’s Angry Dirty. And also, even though voting doesn’t count for bleu cheese, I gotta say that Blind Tiger had the best dressing I ever had (I wanted to do drink it out of a beer stein) and TJ’s had the 2nd best I’ve ever had…really. 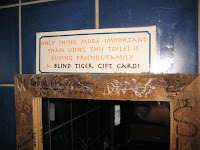 Blind Tiger all the way. The meat was super tender, and had a really good chipotle sauce. I didn’t think that TJ’s wings were anything special, just a typical fried wing… the chipotle was best, as it had a nice sweet flavor to it. 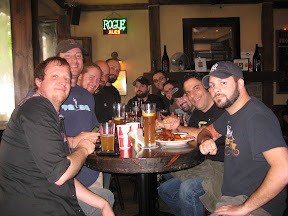 I would definitely go back to Blind Tiger for the wings, and the beer selection… prices were pretty good as well. 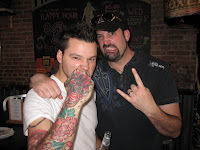 Kyle is by no means the owner at Thunder Jacksons. 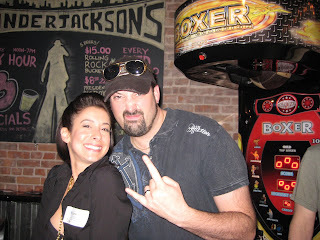 He's designs the website and is the DJ there on weekends. It is a nice hobbie to vist places to check some kind of food. 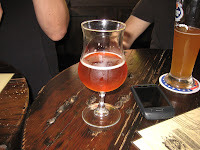 I really like wings with beer but it would nice to try them different to time to tiem.